Nancy Jost calls them the "wonderful women of west central Minnesota"--10 Early Childhood Initiative coordinators who work diligently and passionately in their communities to create thriving environments for our very young and their families. They, in turn, wanted to show their appreciation for their group leader, Nancy Jost, WCI's early childhood coordinator, who convenes, counsels and provides support to this tireless team. Earlier this year, the ECI coordinators nominated Nancy for the Nancy Latimer Award, known as the "Nancy" Award. Given annually by the Start Early Funders Coalition for Children and Minnesota's Future, it recognizes "leadership, vision and commitment to enhancing the social and emotional development of infants and young children." 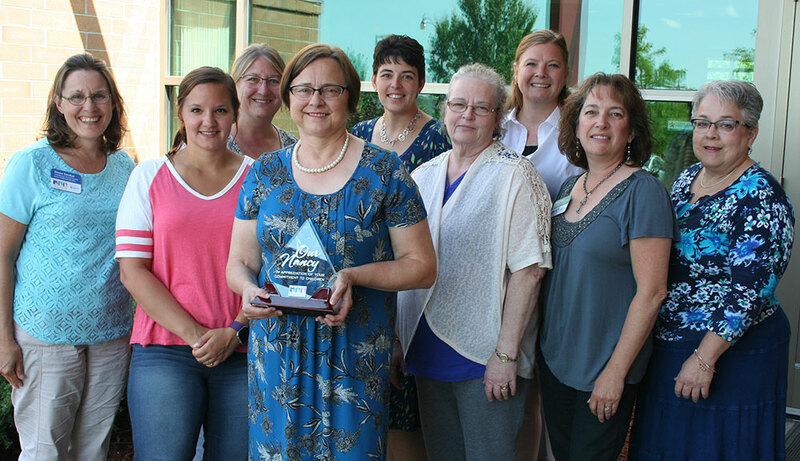 Although Nancy did not receive this year's award, the ECI coordinators decided they would create their own, and presented Nancy with the "Our Nancy" award this month. In their Nancy Latimer Award nomination, the ECI coordinators said this about Nancy Jost: "Nancy’s career résumé says a lot, but her words and actions say so much more. She loves children, and not just her children and grandchildren. She loves all children, regardless of race, religion or economic background. She is a tenacious advocate, addressing the needs and concerns of the youngest children, their families and caregivers. She speaks out with compassion on behalf of children and challenges all of us to be actively involved in our communities and with the policy makers. Nancy has shown us a vision of what we can accomplish together on behalf of the children and citizens in west central Minnesota and beyond." Nancy's response to her one-of-a-kind award? "This means more to me than any other award I could receive honoring my work."